Chiropractic, A Natural Relief for Allergy Sufferers? I was amazed to hear the other day that 40% of the people in this world have reported they suffer from at least 1 allergic condition. What is considered an allergic condition or an allergy? An allergy is a reaction by your immune system to something that does not bother most other people. When someone who is allergic encounters a trigger, their body registers this as more harmful than normal and will release chemicals to fight it. These chemicals or antibodies then cause allergy symptoms. 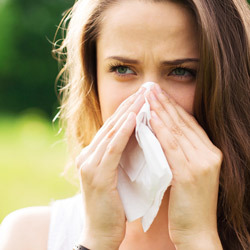 Allergy symptoms can vary from a runny nose, sneezing, itching, rashes, swelling, or asthma. Allergies can range from minor to severe. A severe reaction, called Anaphylaxis can be life-threatening. To diagnose allergies doctors use skin and blood tests. Current treatments include medicines, allergy shots, and avoiding the substances that cause the reactions. Here in the US, we spend more than $3 Billion annually on allergies between medications, doctor visits and taking sick days from work. There is good news though! Chiropractic care can offer allergy symptom relief via a natural, drug-free approach and possibly get you and your family off harmful medications. Strengthen the Immune System-A Chiropractor will look for and correct any misalignments of the spine. These misalignments can disrupt the brains communication with the rest of the body. Regulate Stress Hormones-The adrenal glands work to modulate and reduce allergic reactions. The adrenal glands are directly fed by the spinal nerves, so by properly aligning the spine, the amount of cortisol the body produces can be regulated. This can help alleviate allergy symptoms. Support the Respiratory System-Chiropractic adjustments can help keep the pathway between the respiratory system and the brain open, so it is properly functioning and able to withstand allergy attacks. Recommend Nutrition & Lifestyle Changes-A Chiropractor can offer advice on dietary and lifestyle alterations which may be playing a part in aggravating allergy symptoms. These foods and environmental factors can boost the patient’s health and lessen the severity of allergy symptoms. If this is something you or a loved one are experiencing, schedule a visit to our office so we can help you find natural relief!